Short-track speed skater Elise Christie could become the first Brit to win multiple medals at one Winter Games. The Games will be shown live across BBC TV, radio, online and the BBC Sport app.Team GB will have its best ever Winter Olympics next year by winning five medals, according to data analysts who have predicted the final medal table.British athletes have won a total of 26 medals across 22 previous Olympics with a joint best of four at the 2014 Sochi and 1924 Chamonix Games.UK Sport sets the actual medal targets for Team GB and is expected to announce the figure for Pyeongchang in 2018. Germany tops the virtual medal table with Team GB predicted to finish 21st. Jenny Jones' historic snowboard slopestyle bronze in 2014 was the first medal ever won on snow by a GB Olympian. 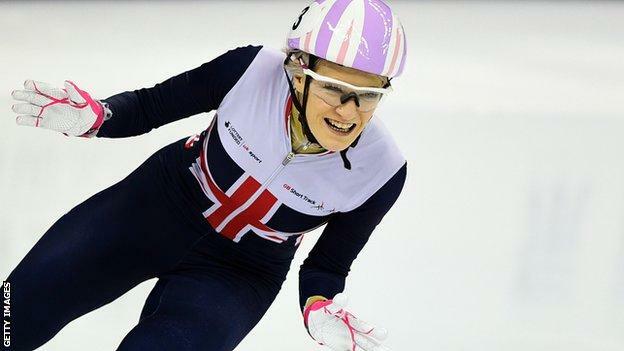 In Winter Games history, the 25 other medals won by GB have been in ice sports.Four of those medals, one gold, one silver and two bronzes, were won at the first Winter Olympics in 1924 - a haul that was matched in 2014.UK Sport has doubled its investment in Olympic winter sports from £13.5m for the four-year cycle to the 2014 Sochi Games to £27.9m for the South Korea event - and will send around 60 athletes to Pyeongchang. The team will be finalised by 24 January. Mike Hay, chef de mission for Team GB, described the four medals won at Sochi as a "quantum leap" but he added: "It's difficult. We've got to put it in context. "We're taking a team of hopefully around 60. We're a non-Alpine country so we've got our own targets and we feel we've got a team that can create their own history there. "We need to get to around six, seven, to become a top-15 nation, and that to me is a credible winter sport nation, that's where we're striving to get to. "British Olympic Association (BOA) chief executive Bill Sweeney told BBC Sport: "Clearly we've had a great Rio Olympic Games after London 2012, and made history in terms of that medal performance, and we're going to Pyeongchang with what we think is our best ever team. All the ingredients are in place to keep that momentum going. "If you look at our athletes going to Pyeongchang, we believe we've got around 12 world class competitors there, who have competed very well in world championships leading up to these Games so if we can convert 50-60% of those into podiums, we're looking into a performance that would be our best ever and could get us into the top 15 in the table." With Wednesday marking 100 days to go until the Winter Olympics begins on 9 February, data analysts Gracenote predict Germany to finish top of the medal table for the first time since Turin in 2006, winning 14 gold medals in a haul of 35.The potential absence of Russia would solidify that position and Germany's strongest sport at Pyeongchang 2018 is likely to be biathlon with 10 projected medals.Norway are predicted to leave South Korea with a haul of 32 medals, six more than their best haul of 26 won at both the 1994 and 2014 editions. The cross country skiers are predicted to win 18 medals, surpassing the Olympic record of 13 set by the Soviet Union in 1988.Canada are forecast to win medals in a joint record 10 out of the 15 sports that will make up the Games. This feat has been achieved in each of the four previous Games - United States (2002), Canada (2006), Germany (2010) and Russia (2014).USA has won at least 25 total medals at each Games since hosting the 2002 Salt Lake City Winter Olympics - and they are projected to win 29 across 10 different sports in South Korea.Should they compete, Russia's dominance of figure skating is expected to continue with another three medals, including two golds, forecast. At the last six Winter Games, Russian figure skaters have won 14 of the 26 gold medals available and occupied 26 of the 75 podium places. France is expected to win 21 medals (nine gold, seven silver and five bronze). This would smash the country's best ever Winter Olympic total of 15 medals, achieved four years ago in Sochi. The French team is expected to be heavily reliant on biathletes Martin Fourcade and Marie Dorin Habert to deliver this record. What would a Russian absence mean? In September, 17 national anti-doping organisations demanded Russia be banned from the Games, pointing to the 2016 McLaren report's conclusions on state-sponsored doping in the country. The International Olympic Committee (IOC) has said a ruling on Russia's participation at the 2018 Winter Olympics will be made in December. Germany are expected to win an additional four medals and Netherlands a further three if Russia are banned from the Games. Team GB's women's curling team are predicted to win a bronze if Russia are absent.The Winter Olympics take place from 9-25 February, 2018 and there will be live coverage across the BBC on TV, Red Button, Connected TVs, BBC Sport website and mobile app.